BCM Provides power and ground and controls timer functions for the interior room lamp, map lamp and trunk room lamp. Push-button ignition switch (with Intelligent Key) Provides ignition switch status to the BCM. 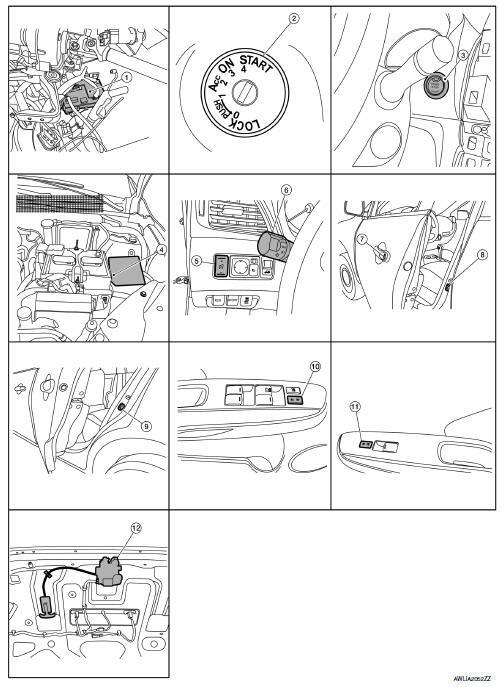 Key switch (without Intelligent Key) Provides key in ignition switch status to the BCM. Door switches Provides door OPEN/CLOSED status to the BCM. Main power window and door lock/unlock switch Provides door lock/unlock switch LH status to the BCM. Power window and door lock/unlock switch RH Provides door lock/unlock switch RH status to the BCM. Front door lock assembly LH (key cylinder switch) Provides door lock/unlock switch LH status to the BCM. Trunk lid opener assembly Provides trunk lid OPEN/CLOSED status to the BCM.